The Lady Vikings didn't waste any time as they improve to 23-1-5 on the season with a win over Houston St. Pius X this afternoon. Sarah Brown and Gwennie Puente each had a pair. Katy Hirschfeld and Marissa Baldasti added one of their own but it was Emily Keoughan, who stole the show for the Lady Vikings with 4 goals, 3 of them coming in a 8 minute span. Head coach, Jay Fitzgerald said he is happy to get win #23 but more impressed with how they got to there. "There was a lot of top class goals today but all year we have been getting chances from a lot of different areas of the field," Fitzgerald mentioned. Of the 27 players on the team, 24 of them got on the field today. The level got better every time there was a change. "We started a little slow but we haven't played a game in a while and I think we had to get our second wind due to the warm temperature," said Fitzgerald. The field temperature at game-time topped 80 degrees and by the time the Lady Vikings take the field again on Monday night, it will have dropped some 40 to 50 degrees. The Lady Vikings look for #24 and are set to travel to Waco ISD Stadium on Monday night to take on Austin St. Michael's. Kick-off is scheduled for 7:30pm. 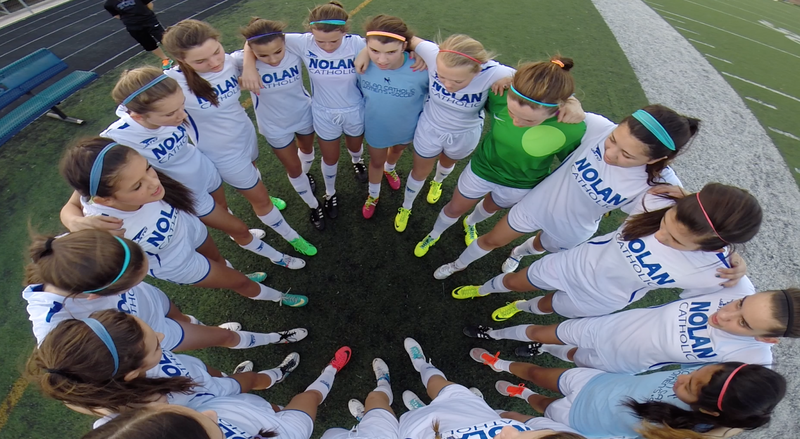 The Lady Vikings will play host to St. Pius X tomorrow afternoon for an early 2:00pm kick-off. Entering the match with a 22-1-5 overall record, the Lady Vikings finish on top of the district earning a first round playoff home match. "Playing at home gives our community a chance to come out and support us, to see an exciting group of players, and to see how much this group enjoys being around each other," commented head coach Jay Fitzgerald. While training camp remains in session for the Lady Vikings, they prove each day that they can get better. Fitzgerald went on to say, "we aren't were we need to be just yet." The TAPPS JV Championships get underway today at Gateway Park in Fort Worth. 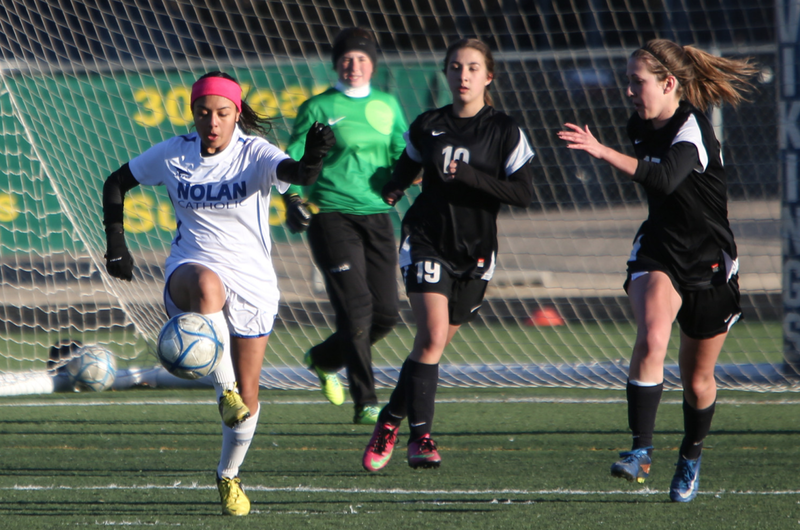 The Lady Vikings secured the top seed going into the event with a 5-0-1 district record. 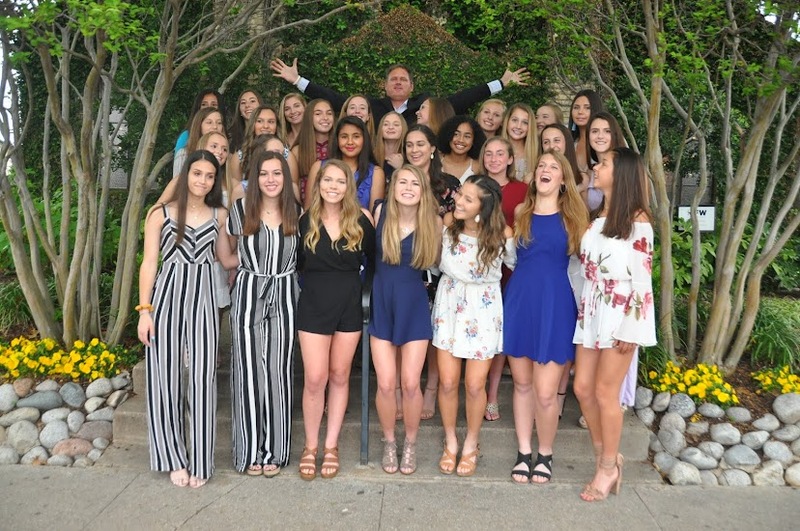 It has been a busy year for the Lady Vikings and 2 tournaments, non-district matches, a couple scrimmages, and their usual 1-5A opponents have put them at a 12-2-2 record looking for their 3rd TAPPS JV Championship in 4 years. "These championships are huge for these young ladies; not only do they get to play for a district title, they get to play for a post-season tournament championship as well," commented head coach, Alex Mechalske. 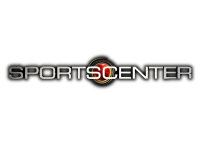 The post-season tournament was created to put the junior varsity teams in an environment to compete for a championship, to have a post-season, and to play for their school, which is no different then what the varsity teams compete for. Both semi-final matches kick-off at 11:00am, with semi-final #1 seeing #2 seed, Ursuline take on the #3 seed John Paul II. The Lady Vikings play in semi-final #2 against the 4th seed, Bishop Lynch. The winners will take to the field at Nolan Catholic's, Doskocil Stadium at 5:00pm this evening with the TAPPS JV Championship on the line. The varsity take to the post-season as well this week as they play host to Houston St. Pius X on Friday afternoon at 2:00pm. Houston St. Pius X finished 5th in District 3, losing out to Duchesne Academy last night in PKs. 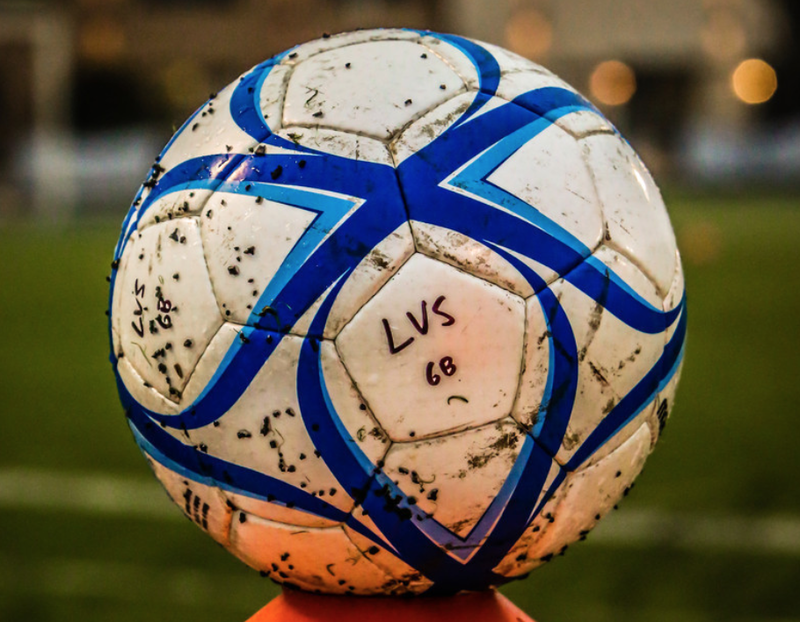 Friday's match marks the bi-district round of the TAPPS Division I Playoffs. The Lady Vikings Soccer Program finished the regular season with another double-header victory, this time against Ursuline. Both teams started off the match strong but no one could get on the board. It wasn't until the second half that Kat Paul broke that deadlock. Paul received a pass from Rebecca Traynor and it wasn't long before she sent the ball sailing over the keepers head for a 1-0 Lady Vikings lead. The Lady Vikings added the 1-2 punch and got on the board again and this time instead of helping on the play, Traynor scored one for herself off an assist from Angelica Navarro. That 2-0 Lady Vikings lead turned into a 3-0 lead when Marissa Baldasti scored from a nice unselfish ball by Katie Ripple, who turned 16 on the day. The Lady Vikings had clinched 1st Place in the district the previous week but this just put a stamp on the regular season improving to 12-2-2 and 5-0-1 in district play. That 1st place finish earned them the #1 seed in the TAPPS JV Championships as they will take on the #4 seed, Bishop Lynch, in Semi-Final #2 next Wednesday at 11:00am at Gateway Park. The championship match will be played at Nolan Catholic High School at 5:00pm that evening. The varsity followed an impressive JV performance with one of their own, in front of another solid crowd. The Lady Vikings took a 1-0 lead on a goal by Jordan Gamboa early into the game and Gamboa nearly missed an opportunity to double that lead but the Ursuline goalkeeper made a solid save on a similar attempt. Lady Bears, Madison Haley, evened the score midway through the opening half but the Lady Vikings fought their way back into the game and capitalized on a set-piece by Gabbie Puente, dipping a well struck ball over the outstretched hands of the Ursuline goalkeeper late in the half to put the Lady Vikings back on top just before the half, 2-1. Holding that 2-1 advantage nearly the entire second half of play, Ursuline finally chipped away at the Lady Vikings and tied the score off a set-piece of their own scored by Katie Lund. We were headed to overtime; Bonus Soccer is what that is called and that is exactly what it was. Last year they were able to pull off a win in the first overtime period off a Sarah Brown goal and this year was no different but a bit more dramatic. "I don't think we wanted to lose the game, you could tell... too much work was put into the evening and we did a nice job of stayed on top of things," commented head coach Jay Fitzgerald. And that, they did......and with 12 seconds remaining in the first golden goal overtime period, Gwennie Puente took a ball from Katy Hirschfeld and knifed her way through the Ursuline pressure before toing the ball just inside the post past the oncoming Ursuline goalkeeper. The Lady Vikings took the 3-2 overtime win, improving to 22-1-5 and will move on to the next game. The next game happens to be the bi-district round of the TAPPS Playoffs which will begin a week from tomorrow, Friday, February 28th. The Lady Vikings will host the first round and will most likely be taking on Houston St. Pius X. and that game is scheduled to kick off at 2:00pm. The JV clinched a first place finish tonight with a 3-0 win over John Paul. Katie Ripple scored 2 goals and assisted the final goal of the game, scored by Rebecca Traynor. The Lady Vikings improved to 4-0-1 in district and 11-2-2 overall. The varsity didn't waste anytime as they built a 5-0 lead at halftime during Senior Night and improved to 12-1-0 in district and 21-1-5 overall. First half goals were scored by Katy Hirschfeld, Gwennie Puente, and Elena Guerra. "We were able to play a lot of players and continue to see our depth," commented head coach Jay Fitzgerald. Sarah Brown, Jordan Gamboa, Marissa Baldasti, and Emily Keoughan scored in the second half. Tonight was a very special night for 7 seniors… Emma Chandlee, Maddie Cook, Elena Guerra, Elizabeth Havenhill, Erin Hippert, Adrian Kallas, and Madeline Rodenbaugh. These 7 seniors have meant a great deal to this program. 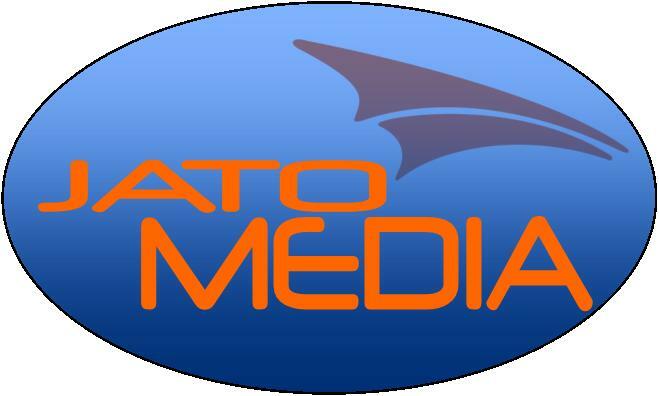 They have contributed in so many ways to the traditions of the program and mission of the school. All of these players have been a part of the Nolan Catholic Women’s Soccer Program since they stepped foot on campus their freshman year. The value they add to the program, the school, and the community is priceless. They have helped the program win their 500th game, win almost 75 games, gain national respect, win back to back TAPPS JV Championships, win their 24th Regional Championship, 2 Final Four Appearances and a State Runner-up finish. They are leaders on and off the field and role models to our younger and future LVS players and not to mention, other athletes in the school. These 7 seniors continue to grow each and every day and all have bright futures ahead of them. THANK YOU SENIORS. The Lady Vikings will take on Ursuline to wrap up the regular season tomorrow night at home. The JV will kick-off at 6:00pm and the Varsity will follow at 7:30pm. The regular season concludes for both the JV and Varsity teams this Week. Monday and Tuesday will be double-headers for the JV and Varsity teams on each evening. The JV will take on John Paul II at 4pm on Monday and Ursuline at 6pm on Tuesday. The varsity will honor their 7 seniors on Monday night against Bishop Dunne. Kick-off is at 5:30pm and the senior ceremony will be at halftime. Seniors Emma Chandlee (Mercer University), Maddie Cook (Texas Tech), Elena Guerra (undecided), Elizabeth Havenhill (Texas State), Adrian Kallas (undecided), Erin Hippert (Texas A&M), and Madeline Rodenbaugh (Texas A&M). 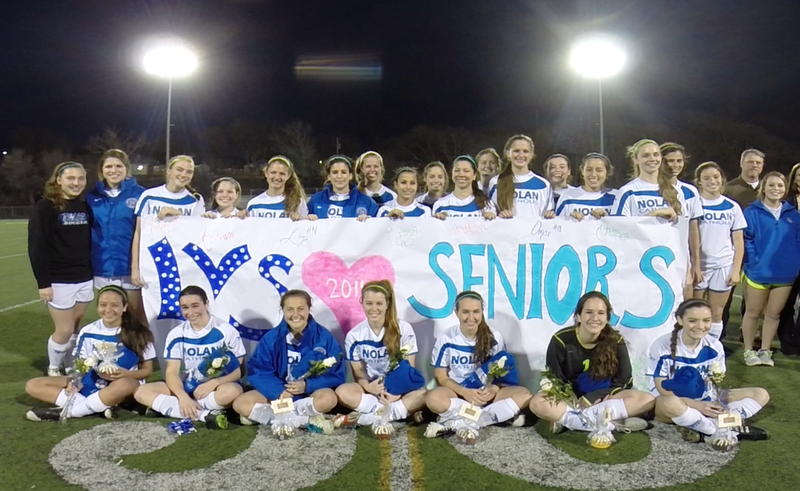 The following night the varsity plays their final district game of the season at home against Ursuline at 7:30pm. The JV will find out their seed in the TAPPS JV Championship after their Tuesday match-up vs Ursuline. The semi-finals will be on Friday with the Championship match on Saturday. All matches will be held at John Paul II. The Lady Vikings Soccer program got wins #10 and #20 on the season against Bishop Lynch tonight. The JV kicked off the double-header in their fourth district match of the season. Junior, forward, Kat Paul, started the scoring for the Lady Vikings and added 2 more to complete the hat trick, before the first half was over. "We took advantage of some spaces, won our 1v1 battles and came away with a convincing win," commented JV head coach, Alex Mechalske. The second half got started and the Lady Vikings continued to put pressure on the Lady Friars with Marissa Baldasti adding the 4th and final goal on the evening. The JV improved to 10-2-2 and 3-0-1 in district play. The Lady Vikings have 2 more district games left scheduled for Monday and Tuesday of next week against, John Paul II and Ursuline. That will complete the regular season for the Vikings. The TAPPS JV Championship will begin on Friday, February 21st and continue into Saturday. On Friday seeds 1 and 4 will play and 2 and 3. The winner of each of those semi-final matches will play in the championship on Saturday afternoon. The Lady Vikings have won the event 2 of the last 3 years. The Varsity followed up the JV victory with a win of their own improving to 20-1-5 on the season and 11-1-0 in district play with 2 games remaining, also on Monday and Tuesday of next week. Elizabeth Havenhill started the scoring for the Lady Vikings in the first half and Gwennie Puente added an insurance goal in the second half with 12 minutes remaining in the match off a feed from Katy Hirschfeld. "The support was tremendous tonight, the Nolan Catholic community came out in force and saw two quality teams compete in one of the best districts in the state," said head coach, Jay Fitzgerald. The Lady Vikings continue district play next week and then the following week the district will be certified and the post-season will begin. 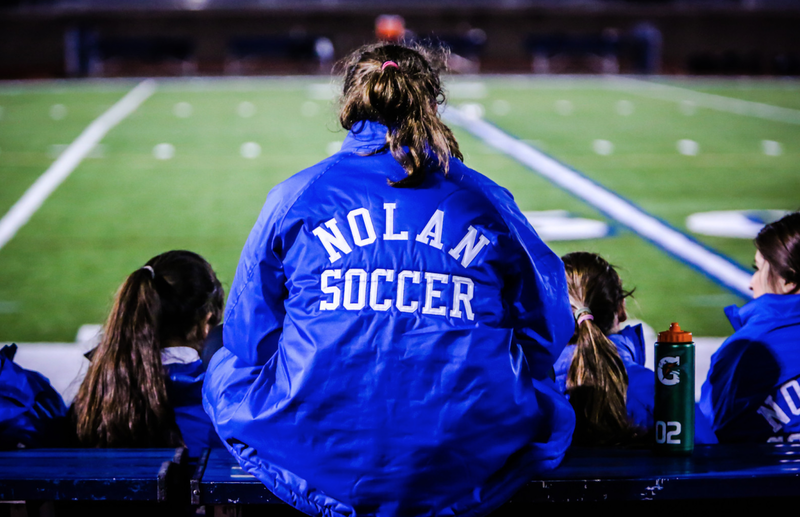 The Nolan Catholic Women's Soccer team is use to playing in freezing to sub-freezing weather and last night they warmed up to the much improved weather in more ways then one. The Lady Vikings improve to 10-1-0 in district play with a 5-0 win over Liberty Christian yesterday evening. Gwennie and Gabbie Puente each get a pair of goals, while Emily Keoughan added one of her own. Katy Hirschfeld and Emma Chandlee get helpers on 2 of the 5 goals while the Puente's helped each other. "We needed a convincing win tonight with all the day's off we have had," commented head coach Jay Fitzgerald. "Our group put together a solid performance tonight and we scored some quality goals," Fitzgerald added. Playing their second of 3 district games this week, the Lady Vikings were much more cohesive on the night, established a good rhythm as the match grew older, and scored some of their best goals of the year. The Lady Vikings conclude the week tonight with a Valentine's Day double-header at home against Bishop Lynch with the JV getting the night started at 4pm before the varsity kicks off at 6pm. The Lady Vikings stepped onto a rain soaked field at Prestonwood Christian last night for their second meeting against the Lions this season. As the benches iced over and the mist fell from the sky, the Lady Vikings continued to crack away against a very organized Prestonwood side. The Lions hit the bar and then the Lady Vikings hit the bar, it was back and forth for most of the match until Gabbie Puente was able to feed her sister, Gwennie, for the games only goal. "We have played in worse but tonight because it was wet, made it a little difficult to keep a rhythm... any win during this part of the season is a good win, especially a shutout win on the road," commented head coach, Jay Fitzgerald. Prestonwood dropped to 2-7-0 in TAPPS 1-5A district play while the Lady Vikings improved to 9-1-0. The Lady Vikings have also cracked into the nations Top 20, coupled with a #4 state ranking. Liberty Christian plays host to the Lady Vikings on Thursday night at 6:00pm. The JV match scheduled against Grapevine Faith for Thursday night may be rescheduled as the Faith team might have to move a district match to that night. The Lady Vikings varsity team will travel to Prestonwood Monday night for their second meeting of the year. The match was originally scheduled to kick-off at 7pm. That start time has been moved earlier and will now kick-off at 5:30pm. The bus will leave at 3pm and return at 8:15pm. The JV practice remains the same, 2pm at the stadium on Monday afternoon. 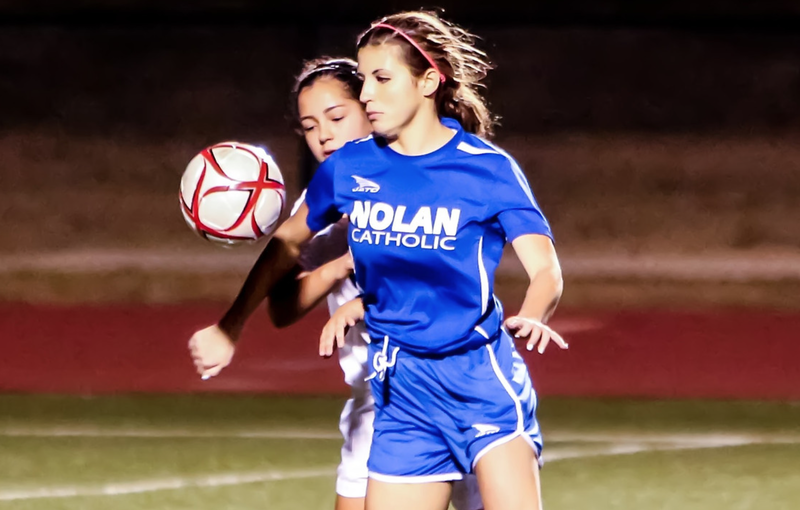 The Lady Vikings hit the road for 2 games next week before coming home end of the week to host Bishop Lynch on Friday. Plano Prestonwood and Liberty Christian play host to the Lady Vikings on Monday and Thursday. 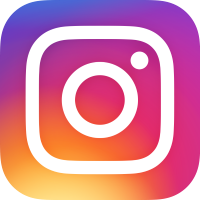 The JV is scheduled to play against Grapevine Faith at 4:30pm on Thursday in Grapevine before they take on Bishop Lynch on Friday at home at 6:00pm prior to the varsity match. The JV and Varsity matches today and tomorrow have been rescheduled to next week on Friday, Feb. 14th. The tentative times for those matches are 4:00pm and 6:00pm. Waiting on the referee assignor to confirm the availability of the referees. It is National Signing Day today at Nolan Catholic and senior, LVSers, Liz Havenhill and Emma Chandlee will both sign their National Letters of Intent to play at Texas State University and Mercer University. Both 4 year starters, Havenhill and Chandlee have helped the Lady Vikings to over 50 wins. Over those 4 years, they have contributed to the local, regional, and national respect the Nolan Women's Soccer Program has gained with a National Ranking as high as #25, two regional championships, 2 final four appearances, and one state runner-up finish. They will be signing their official NLI's today in the arena at 2:30pm. 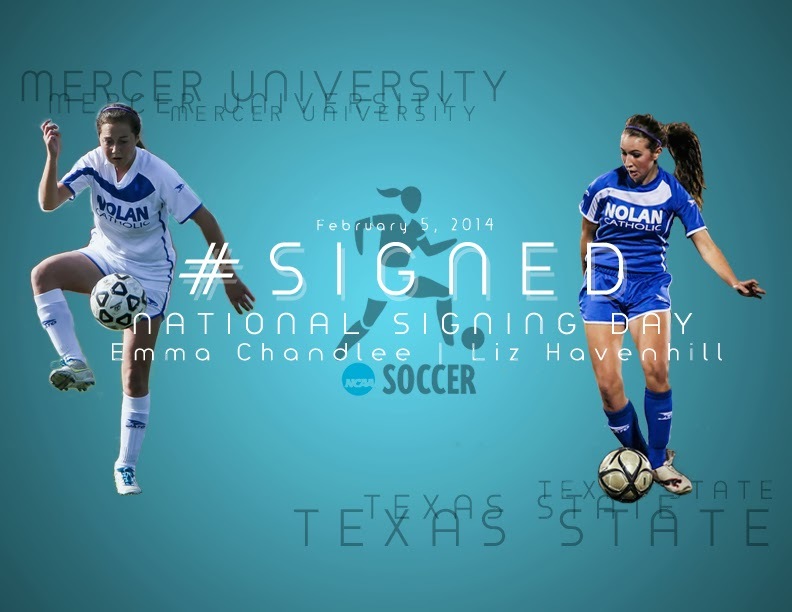 Congratulations go out to Liz and Emma. Just 10 seconds in to the Nolan/Ursuline match, the Lady Vikings were on the board. Liz Havenhill took the feed from Katy Hirshfeld and raced in behind sending a low driven ball across the box to Gwennie Puente who knocked it home for an early Lady Vikings lead. The Lady Bears were able to climb back in the match with a goal of their own from Katie Lund. With the score tied at 1-1 going into halftime, both teams looked to set the tone early to establish the lead. Each team traded punches in this end to end match but it was the Lady Vikings who were able to regain off the Havenhill/Puente combination which proved to be the game-winner, even though Nolan Catholic would strike again in the 60th minute off a header from Puente from a early diagonal service from her sister, Gabbie. "We scored goals tonight from 3 different areas of the field, " head coach, Jay Fitzgerald commented. Goals came from endline service, early service, and dribble penetration. Fitzgerald continued, "We were unpredictable tonight using tons of energy playing against a tough, skillful Ursuline group." The Lady Vikings improved to 17-1-5 and 8-1-0 in district play. They will host Bishop Lynch on Thursday night at 6:00pm (JV) and 7:30pm (Varsity) at Doskocil Stadium. The JV will host Ursuline tomorrow at home at 6:00pm.